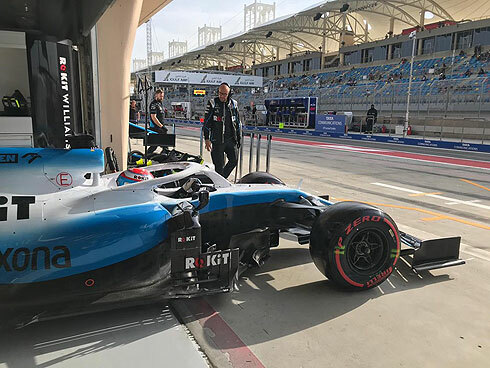 The final Saturday practice for the 2019 Bahrain GP would again see the ROKiT Williams Racing drivers slowest in the times. 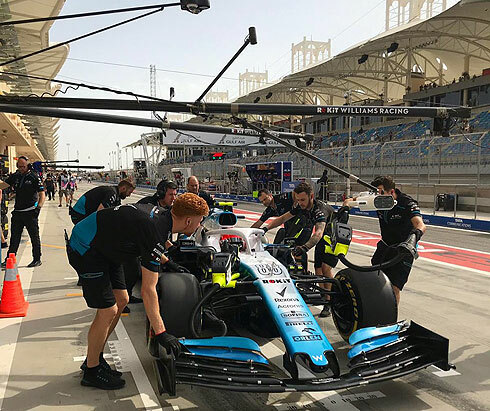 George Russell would again lead team-mate Robert Kubica but at least this session would see a closing in the gap between the pair especially in light of Robert's frustation that there were issues with his car that had seen him significantly slower than his team-mate on Friday. Both drivers would easily finish well within the 107% rule so qualifying despite again going to be difficult should see both drivers start the race. Both Williams drivers would complete their installation laps while it would be Vettel who sets the first time with a 1m:31.617 followed by Leclerc. Raikkonen would move into third followed by Ricciardo and Giovinazzi. Grosjean would move into fourth as more drivers started to come out for their first runs with forty minutes remaining. Bottas would go quickest with a 1m:31.169 followed by Kvyat both on the soft tyre. Vettel was now third followed by Sainz, Leclerc, Raikkonen, Grosjean, Ricciardo, and Giovinazzi. After runs on used soft tyres the Williams pair were 19th and 20th and again slowest. George would again be ahead of team-mate Robert. At the front Verstappen was now fastest with a 1m:30.959 from Hamilton and Bottas. But then we would see the Ferrari's improve with Leclerc quickest with a 1m:29.569 followed by Vettel. The Williams drivers remained slowest with fifteen minutes remaining. Verstappen was now third from Hamilton, Bottas, Hulkenberg, Kvyat, Sainz, Norris and Perez tenth. The track was now very busy with everyone coming out for their qualifying simulations with five minutes remaining. Grosjean was now third followed by Norris but Bottas would go third only to be passed by Hamilton. Grosjean was now fifth followed by Hulkenberg, Norris, Verstappen, Sainz and Kvyat tenth. 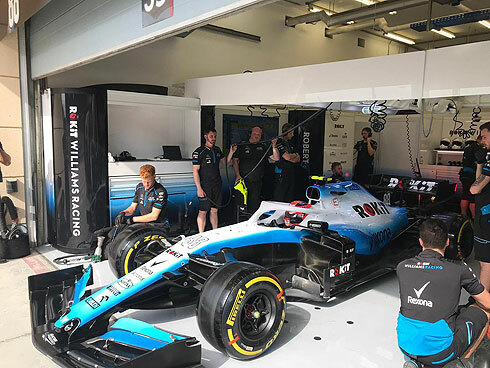 Not surprisingly the Williams pair were slowest but the gap between George and Robert had closed which would appear to indicate that the Williams team had addressed the issues with Robert's car from Friday practice. Robert would be first out in the final practice session running on the medium tyre. he would pit after a single lap. With thirty five minutes remaining Robert would return this time on a set of used soft tyres. A 1m:35.770 from Robert on his first lap. He would improve with a 1m:35.385. Robert would pit after a seven lap run. With under ten minutes remaining Robert would return for what would be his qualifying simulation, running on the soft tyre. Robert would improve significantly setting a 1m:33.525 to be much closer to his team-mate. He would pit ending his session remaining 20th. George would follow his team-mate out shortly after but he was running on the hard tyre. George would report that his DRS was not working but this would be resolved when he returned to his pit. George would come out for his first timed laps running on the soft tyre. Like Robert they were a used set. George was able to set a 1m:34.320 to be 1.0s ahead of his team-mate. He would also improve with a 1m:34.167 and would pit after a six lap run. George would also come out for his qualifying simulation also on a new set of soft tyres. He would set a 1m:33.387 to remain 19th. He would pit to end his session.